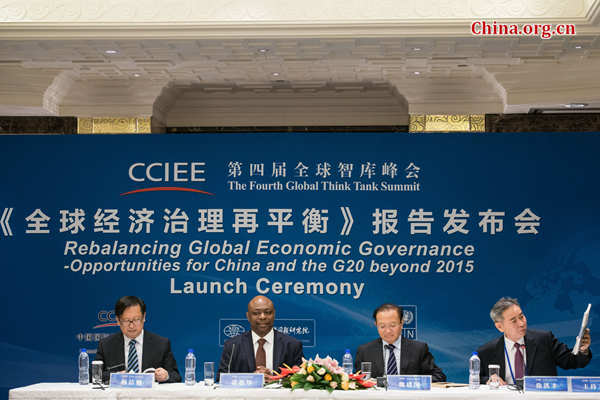 Second Global Governance Report suggests that China can use G20 presidency to enhance its political and economic global influence by putting development at the top of the agenda. The United Nations Development Programme (UNDP) in China last week released Rebalancing Global Economic Governance: Opportunities for China and the G20 Beyond 2015, a major report which recommends that China use its presidency of the Group of Twenty summit in 2016 to give the Group a development-focused agenda. The report is jointly published by UNDP, the China Center for International Economic Exchanges (CCIEE) and the Shanghai Institute for International Studies (SIIS). Building on discussions and findings from the Second High-level Policy Forum on Global Governance in Beijing on 22 October 2014, the report analyses the challenges facing global economic governance today, and highlights the upcoming Sustainable Development Goals as the clearest expression of these challenges and the measures that are required to address them. It issues a call for the international community to rethink the institutional architecture that shapes global economic activity, to help the world’s nations meet the Goals. This broad look at global economic governance is then followed by a detailed examination of China’s present status as the largest developing country in the world, and the role that it might play in steering global governance and the delivery of global public goods. After asserting that China has the potential to be of significant assistance by offering both leadership and experience as a developing country, the final chapter of the report explores how China can use its upcoming G20 presidency as a platform to contribute to global governance. SIIS Academic Committee Chairman Mr. Yang Jiemian welcomed the report, saying “peace and development are two important topics; realising them needs the effort of individual nations but also the pooling of efforts by nations, as well as inclusive governance and win-win cooperation.” His organisation contributed research and analysis as academic partner to the report. Rebalancing Global Economic Governance offers nine principal suggestions to Chinese policymakers as they formulate their approach to next year’s G20 summit, clustered into three areas. 1. To support growth, China could promote policies that boost economies while investing in infrastructure and sustainable business. It could push for green growth by encouraging G20 nations to commit to build on the October 2014 US-China climate change agreement. 2. To stimulate development, China can encourage the G20 to enhance balanced and inclusive win-win growth. They could do so by taking action on domestic taxation and social policy and translating the SDGs into their own national plans, as well as pledging to help developing countries to do the same, including through improved data collection. 3. To create a global economic architecture that is fit for purpose, China could drive for convergence and harmonisation between the Bretton Woods Institutions and new institutions such as the AIIB and the NDB. Although the report is primarily aimed at Chinese policymakers and practitioners, China’s present growing global engagement means its findings are also of great relevance to government and academia in the wider international community. It hoped that this research will be of use to all who seek to understand China’s growing global engagement, and how this engagement might best proceed in the best interests of both China and the rest of the world.